Twice a term an increasing number of gentlemen meet to hone their oratory skills, gain confidence in front of an audience, as well as being exposed to an international level of public speaking. Public Speaking is without any doubt a skill that can be used to empower young people, and actively change lives for the better – and Bishops has constantly produced an unbelievably high standard of speakers. 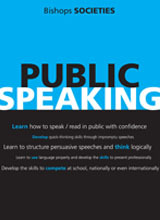 Society meetings include tutorials on the different categories of public speaking, impromptu speaking as well as debating workshops, high ranking national speeches and many more enjoyable speaking activities. The highlights of the yearly public speaking calendar are the national competition (NIDPSC) which takes place every September where the South African team is selected, and the world competition (WIDPSC) taking place the following April. Over the past few years, several boys have been selected to and ranked at provincial and international competitions, as well as Bishops being a stand-out school at many inter-school competitions. In 2005 and 2006 Bishops took teams to The Hotchkiss School in the USA and The English School in Cyprus to experience the standards and organisation of “Worlds” (WIDPSC) and then hosted this prestigious competition in 2007. Worlds at Bishops is still described as the best ever, not least of which for the spectacular Peninsula tours, the wonderful South African hospitality and the high standard of the competitors. In 2008 Team South Africa was awarded national colours for the first time as a result of the inclusiveness of the competition, and for incorporating a development component where the best competitor from a disadvantaged school was included on the team with full sponsorship. The society meets at least thrice a term and boys are encouraged to look in the pink notice as to when meetings will be scheduled. New members from all grades are welcome to join and once have attended their first meeting. Nationals (NIDPSC) 2014 takes place in September at Clarendon Girls' High School in East London - dates to be confirmed. Worlds (WIDPSC) 2014 takes place in Lithuania from 23 - 29 April. We wish Rahul Naidoo, Dan Mesham, Nic Cullinan, Nikhal Narismulu and Desmond Fairall well for Worlds!